You are here: Home / All posts / Segregation and inequalities: what should we take from the Casey Review? The publication of the Casey Review into Opportunity and Integration has been accompanied by intense debate. The review’s unbalanced focus on Pakistani and Bangladeshi communities and people of Muslim faith, and its implicit suggestion that integration is the responsibility of minority groups rather than a collective one, have understandably caused concern. 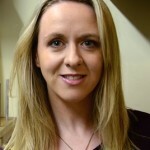 However, Dr Gemma Catney of the University of Liverpool argues that while we must be critical of the more problematic elements of the review – especially at a time when the need to heal societal divisions has become so urgent – a rejection of the review’s better-substantiated evidence risks throwing the baby out with the bathwater. Careful engagement with the stronger and more objective evidence presented in the Casey Review – especially on important themes such as socio-economic inequality and segregation – is needed. The review’s recommendations are as yet inexplicit in their specific objectives and targets. This could represent an opportunity for those with influence to shape future policy intervention to ensure that the actions taken are fair and their outcomes are beneficial. The alarmist press coverage of the review in some publications is ironic given that the report discusses the role of the media in reinforcing the stigmatisation of some communities. A key strand of the more doom-laden media coverage of the Casey Review has suggested growing ethnic residential segregation. Yet the evidence is quite the contrary, which the review demonstrates. 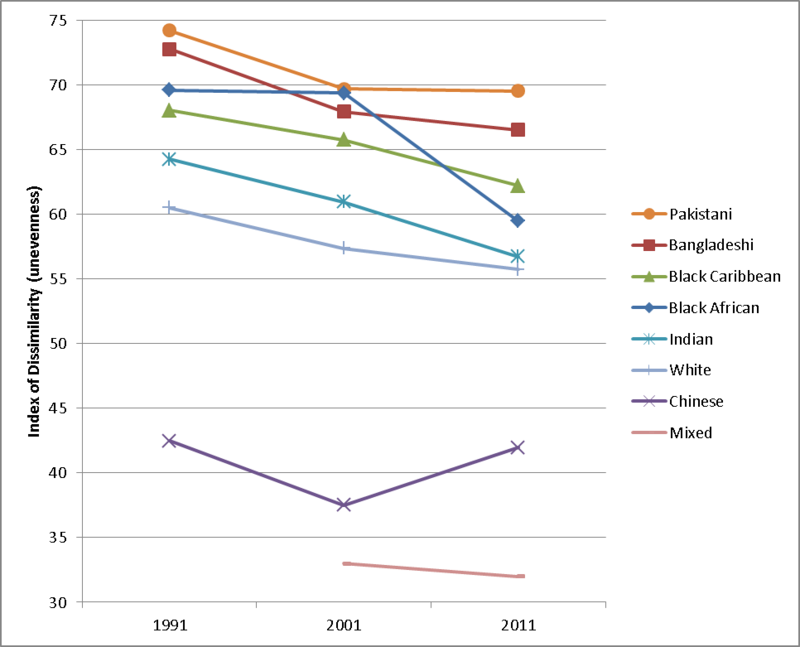 The Casey Review draws on my own research to explicitly show how ethnic residential segregation has declined over the last two decades (see figure; the exception is the Chinese ethnic group, due to migration to university towns and cities). This analysis explores Census data for 1991-2011 and uses a measure of the geographic spread of ethnic groups (the “Index of Dissimilarity”). Elsewhere, I use this measure to show how neighbourhoods have become less segregated, during a period of increasing ethnic diversity. 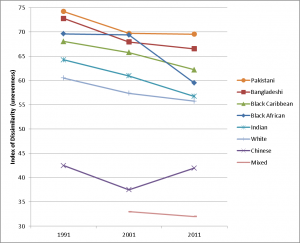 This is the case for every ethnic group – majority and minority – as evidenced in more depth here, where a matrix is provided to compare change in segregation for each ethnic group between 2001 and 2011. This pattern of decreasing residential segregation is mirrored for school segregation. In line with much of Dame Louise Casey’s review, the main section on segregation is subject to an unbalanced focus on Pakistani and Bangladeshi populations. This is pursued further with an analysis of ward-level percentage “concentrations” of South Asian and Muslim groups. But we must remember that this is a descriptive measure of the proportion of a group in an area and not a measure of segregation: it cannot tell us how clustered, isolated, or dispersed groups are within and between neighbourhoods. Nor is this claimed in this section of the review – where the difference between segregation and concentration is clearly defined by Casey’s team. However, in its opening summary the review cites “worrying levels” of segregation. This is at odds with the data presented which show declining segregation. In fact, the UK is becoming more spatially integrated as it becomes more ethnically diverse. Between 1991 and 2011, diversity spread out geographically, growing in traditionally diverse urban wards but also in suburban and rural neighbourhoods. This is not to deny that there is segregation both in neighbourhoods and in schools, and more so for some groups than others, but the processes behind these patterns are multifaceted. The Casey Review itself recognises this in one section through a balanced discussion of the positive and negative causes and consequences of segregation; unfortunately this thread does not run through the whole review. Demographic momentum – the balance of births and deaths – of groups with young age profiles means that some minority groups will of course grow in areas where they are already populous. This is not self-segregation or polarisation, but an outcome of families living and growing together. Familial ties and neighbourhood attachment and belonging are difficult to interpret as threatening or divisive. Indeed, the review revealed that 89% of respondents to the Community Life Survey felt that they lived in a cohesive community, where people from different backgrounds get on well together. White British segregation is by far the most dominant residential pattern in the UK, yet it receives no mention in the review – a noticeable omission given its aim to comprehensively explore integration in an increasingly diverse society. A less positive reason for residential segregation for ethnic minority groups in some local areas is the outcome of fear and experiences of racism and discrimination, meaning that some neighbourhoods represent safe havens from intolerance elsewhere; this is also highlighted in the review. In addition, geographical concentrations can be the result of ethnic inequalities which translate into barriers for residential mobility and restrict neighbourhood choice. The internal migration patterns of ethnic groups are similar across all groups including White British, but differentiated by socio-economic class. Aspirational migration to the leafy suburbs can only be realised by those who have sufficient financial resources; the lower rates of social mobility for Pakistani and Bangladeshi groups than for White groups, and their concentration in deprived neighbourhoods, are reported in Casey’s review. Indeed, despite some improvements over the last 20 years, stark disadvantages remain for ethnic minority groups in employment, housing, education and health. The Casey Review provides clear evidence of some of these ethnic inequalities. As examples, it highlights that those in the Black, Pakistani or Bangladeshi ethnic groups are three times more likely to be unemployed than those in the White British group, and it discusses the low status of employment for men in the Pakistani and Bangladesh ethnic groups who are in work. The geography of disadvantage is also outlined; worryingly, the most deprived 10% of areas of England are home to 31% and 28% of people in the Pakistani and Bangladeshi ethnic groups respectively. Yet despite its evidence base, of the 12 recommendations put forward in the review just two explicitly refer to the reduction of inequalities for marginalised groups. Even then, the focus is more on reducing “cultural barriers” to employment than structural ones such as employer discrimination and poor labour opportunities in some locales. Hopefully this will not represent a missed opportunity to reduce poverty, improve quality of life, and tackle discrimination. Geographical inequalities in opportunity will be a core part of Prime Minister Theresa May’s audit of racial disparities in public service outcomes, which was launched in August 2016 to focus on minority groups and the White working class. By explicitly referencing spatial differences, May (perhaps unsurprisingly as a Geography graduate) recognises that geography matters – and even more so when ethnic group differences are considered. The intersections between poverty, ethnicity and place are complex, and we need more evidence on the relationship between segregation and deprivation. Despite its more controversial elements, hopefully when the dust settles Louise Casey’s review and the debates inspired by it can act as an impetus for policy intervention which targets those most in need. An earlier version of this article was posted on Integration Hub on 12 December 2016. Dr Gemma Catney is Lecturer in Human Geography at the University of Liverpool and an affiliate member of the Centre on Dynamics of Ethnicity (CoDE) at the University of Manchester. She is a Population Geographer with research interests in internal migration, and ethnic residential segregation and integration in Britain. Her research focuses on understanding the evolution of ethnically diverse neighbourhoods and on the existence, and persistence over time, of ethnic inequalities.